On the first day of Christmas, Girl Meets Dress gave to me… An advent calendar right up to Christmas day with competitions, a tonne of prizes to be won, discounts galore and much much more! At Girl Meets Dress, we want to make all your dress dreams come true with festive treats from beauty brands and even greater discounts off our dresses. What better way to start the Christmas celebrations than with a massive Twitter competition and the chance to hire a dress of your choice, entirely for free! The Prize: x1 gorgeous party dress rental, choose from over 4,000 dresses. x1 of our incredible party boxes with all sorts of exciting goodies inside, worth over £50! Find your perfect dress and click on it. Copy and paste the URL of the product page into a new Tweet in your Twitter account. 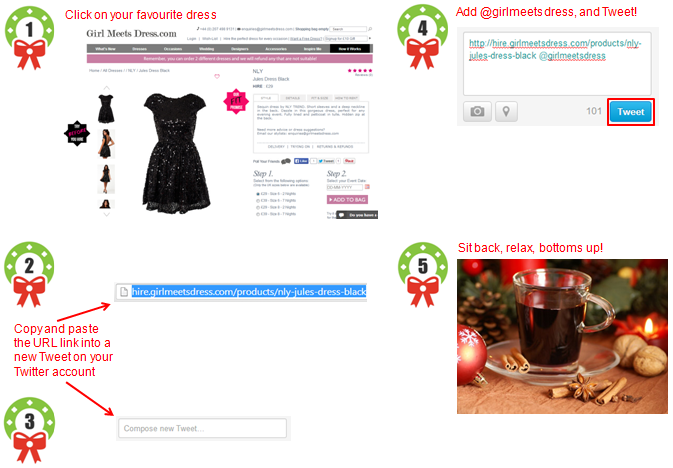 Add ‘My Favourite Dress Is…’ to the beginning of the Tweet and add ‘@girlmeetsdress’ to the end of the Tweet. Sit back, relax and wait for the mulled wine to warm up, you have now entered the competition – it’s that simple! The Deadline: Midnight Wednesday 25th December. Don’t forget to come back every day for a new surprise, who knows what’s behind the next door?! Applicants may enter the competition multiple times. Each entry or Tweet from a single applicant must be a unique dress. Dress rental is for 2 days and standard delivery charges apply. GMD’s standard Terms and Conditions of the dress hire apply. Please read them here. And keep an eye out for our Christmas and New Year’s Eve delivery dates, you can find them here. Posted December 1st, 2013 in Offers & Competitions, Uncategorized. Tagged: ball dress, Ball dresses, Ball gowns, Celebrity Dresses, Cocktail dress, cocktail dresses, Designer dress, designer dress hire, Designer dresses, Dress Hire, dress of the week, Dresses, Evening Dresses, Girl Meets Dress, Herve Leger, hire celebrity dresses, hire cocktail dresses, Hire dresses, long dresses, NLY, party dresses, Prom dress, rent celebrity dresses, Rent designer dresses, rent dresses, short dresses.